This topic contains 3 replies, has 3 voices, and was last updated by anonymous 3 days, 11 hours ago. I couldn’t make it back to Thailand for Songkran this year, but there’s a party at a local wat. Should be great, wet fun. That does look like fun! Lucky you to have been a part of it in the past, there’s always next year. I lived in Thailand for 13 years, and each year we had three major new year parties – the western New Year (which is also a Thai holiday), Chinese New Year (Thai holiday; some people insist on calling it Lunar New Year, but there are many lunar new years around the world), and Songkran, Thai New Year. 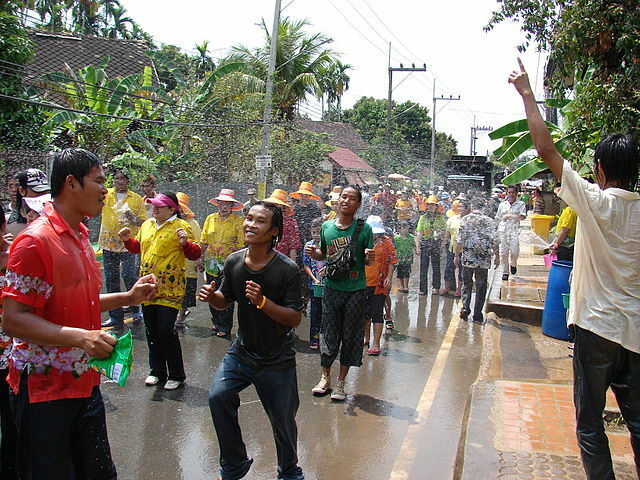 I just looked it up and found that Songkran is even more widespread than I thought – it’s celebrated in Lao, Kampuchea (Khmer people), Sri Lanka (originated with the Sinhala), Pama/Myanmar, and a few parts of Vietnam and China. We didn’t celebrate Muslim (Hejra) New Year, but did celebrate ‘Id al-Fitr (which is also a Thai holiday, at least in the south where I lived). Good times – and a fabulously inclusive celebration. Thailand has been so hot this year that some water splashed around would have truly been a delight.